All those who assume the groom to have absolutely no worries on deciding what to wear to his wedding are in for a surprise. Its all because of a false inclination created when few people din’t care how they looked, or gave a second thought to what they wore and did not consider for a moment the appropriateness of their attire for any festive occasion they deigned to grace with their presence- while some people do fit the description, you would be surprised to encounter most of the male population in India who are fashion conscious and know exactly what they want to look like when they tie the knot. . Even though a man is not fashion conscious he might want to look his best on a day where he is going to be tied sacredly to the one he is going to spend his lifetime with which is why groom fashion is so important. Amazing groom fashion would start with an amazing wedding suit ! But before you start shopping, you need to understand what groom style you are interesting in sporting. There are a lot of Men Indian Outfits for wedding out there ! If your wedding is going to be super formal event, you can wear a tuxedo or indo western wedding suit. And if your wedding is a casual themed wedding, you can go for dhoti-kurtas or patterned kurtas or even better ethnic jackets paired with western wear or a elegant Jodhpuri suit. If you have a relaxed wedding and do not want to splurge a lot on your wedding attire, you can rent a designer wedding suit . If your wedding is the classic Indian big fat affair, your best bet is the Royal sherwani. Even if you go the sherwani route,you will still have plenty of options to personalize. 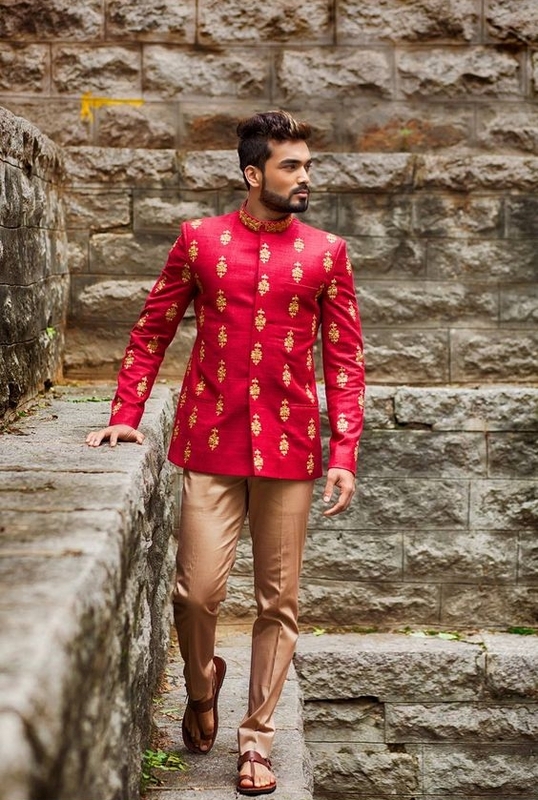 The fashion industry is brimming with designer Sherwanis and you have plenty of options to customize your wedding suit! And do not forget your shoes ! Your shoes must compliment your wedding suit and awesome shoes redefine fashion choices of a man ! 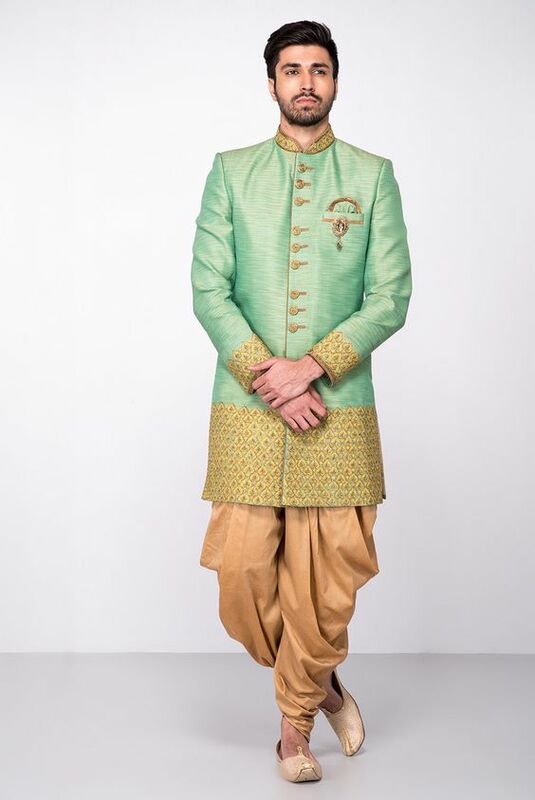 Whether you're renting or buying, going formal or casual, here's what you need to know about mens indian outfits for weddings attire, plus top style tips to keep in mind while choosing your wedding outfit. Scroll down below to our gallery of Indian groom wedding dress picture options to get even more groom's wedding attire ideas. Women start talking about what they are going to wear to their weddings from their childhood days. Remember the amazing comic movie, Bride wars? But when it comes to wedding dresses for men, they are the less talked ones. As much as we like to talk about our big day and the bridal couture, the makeup , bridal mehndi and the bridal hair, the bride's partner is very much neglected . Lets not forget taking their wedding vows is equally special for the men as it is for the brides. Gone are those times when our bride's wore silk sarees, heavy lehengas and shararas and the groom spotted next to her wearing the same old sherwani. 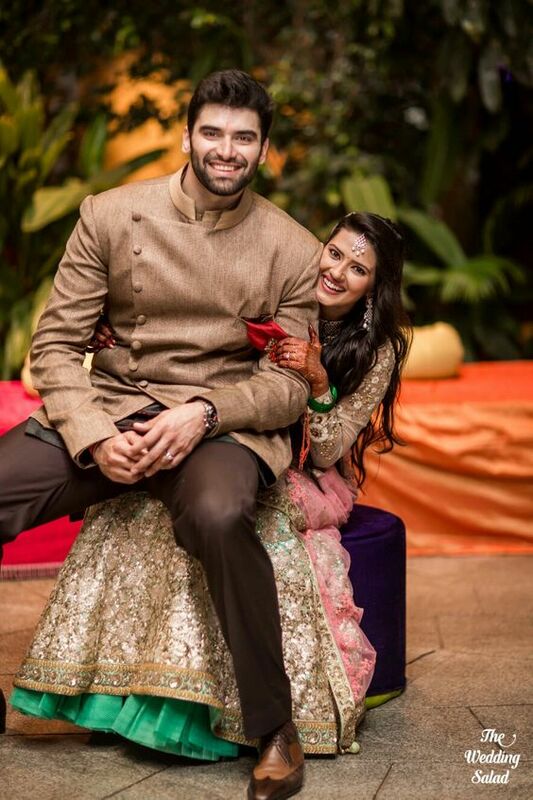 21st century has given light to bride grooms who look equally elegant and stylish as much as the bride's of India ! Now every time you look into a big fat wedding's Photo album there is a Sabyasachi or an Anushree Reddy bride, next to her is also our very stylish and ravishing groom in his latest wedding wear! You might not believe us but there are tons of stylish options for the groom to choose from. 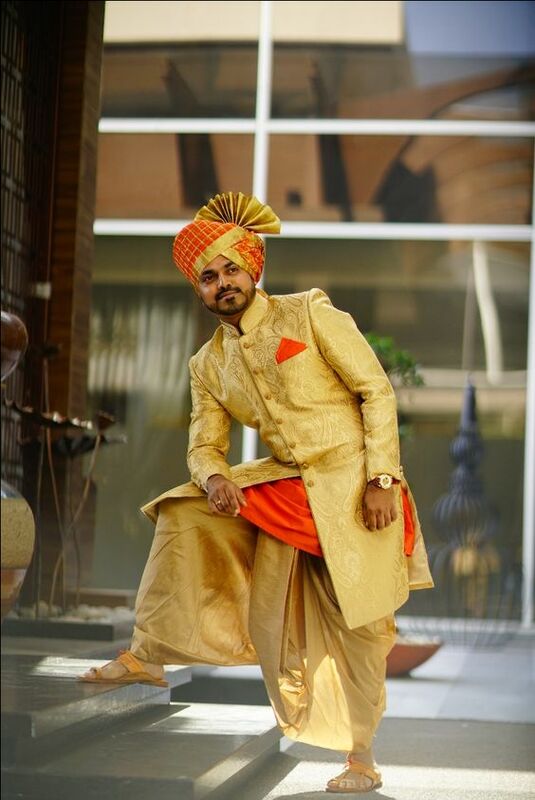 Men in India or shall we say Indian grooms of India have upped their fashion game and can be spotted sporting few of the best stylish wedding outfits you could come across. If you are one of those who don't mind spending a little for your special day , you can opt for designer wear , which for obvious reasons will be heavy on your bank balance. But for all those who want something more affordable yet glam , one that is easy on your pocket but does not compromise on the looks can get these latest groom wear stitched from your favorite boutique or even your local darzi ! But we would insist on spending a little more on your wedding outfit, after all the day is equally special to you and your partner! There is nothing we love more than a man decked up in some serious traditional wear. Indian brides always dream of that moment where they would clap their eyes on their husband-to-be for the first time, royal and ravishing and waiting for you at the Mantap. Thanks tp Indian designers and Online websites selling men's wear, men have some really amazing tailored and ready to wear options now, perfect for every budget. What To Wear To Your Wedding? Indian Groom Wedding Dress! Every groom can now make his dream come true of making a mark on their wedding day. Latest wedding wear for Indian grooms are showcased in the fashion shows and year after year new trends have emerged, giving a lot of great styles to choose from. From classic Bandhgalas and Lavish Sherwanis to dapper Jodhpuris, fun kurtas and mix and matching with a waistcoat in different colors , cuts and fabrics to the ethnic jackets and ethnic pants, Indian men are in for a treat if they are getting married in 2018! Indian groom wedding dress has definitely evolved and 2018 holds a lot of promises to the men tying the knot! When you are getting marries, its best to stick to tried and tested classics. The fun part is that you can add your own elements of traditional touches to color coordinate with what your partner is wearing on the wedding day. There is enough room for creativity but make sure you do not cross the line as you are going to be the center of attention. There are loads of outfits which will help you show off your personality and make you the star of the evening. Its true women might have loads of options when it comes to Indian wedding wear but men seem to have very limited options and hence we are going to help you find the most suitable outfit from the best of Indian groom Wedding Dress! Its a special day for the bride and the bridegroom. The bride might outshine the bridegroom but our groom deserves his share of stardom on his wedding day. So here are the 10 best and latest wedding suits for groom. The groom can pick between traditional to indo-western outfits as most Indian grooms prefer to stick to a completely traditional groom dress like a stylish sherwani or wear something that is a modern mashup – an Indo-western outfit. 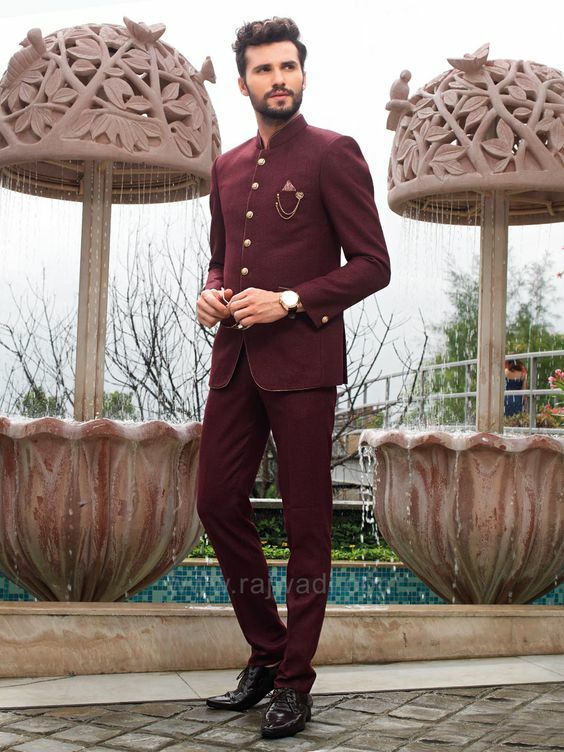 The top trending styles mens Indian outfits for weddings are a mixture of fine Indian craftsmanship with western style blended in a single wedding suit! 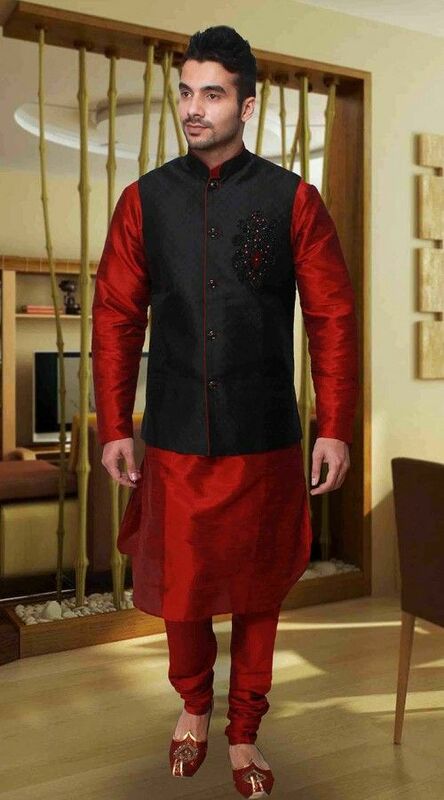 Let’s take a look at some amazing mens Indian outfits for weddings for your wedding. One trend that is never going to die and will top the charts in the Latest Indian Groom Dress Ideas For Reception every time is the mesmerizing Sherwani ! All those Mundas who want to stick to our basic traditional theme, this is your best bet. Its one of the basic wedding groom outfit that can be customised to the maximum. 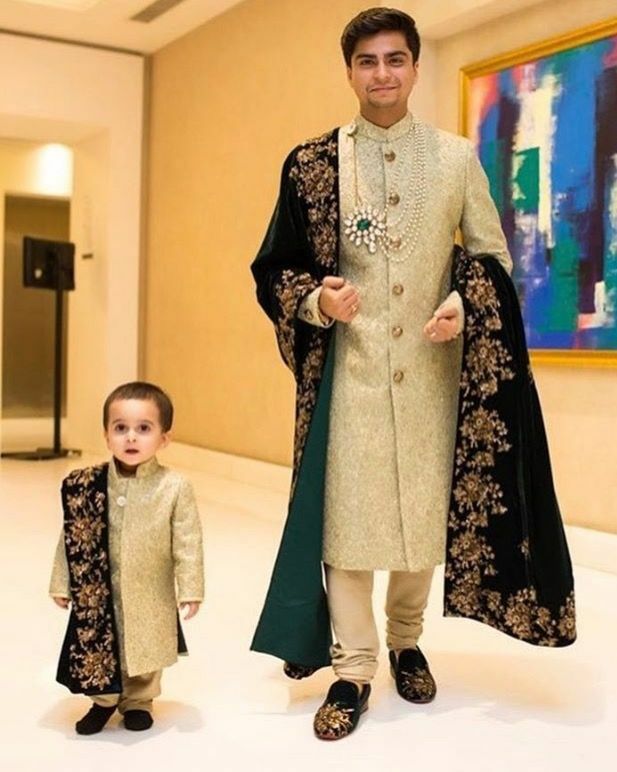 Indian fashion designers and Bollywood industry have influenced people to wear sherwani that are more heavy and embellished versions of the Sherwanis. This has also given way to designer Sherwanis in various fabrics, colors and silhouettes. If you are a North indian bridethen your ideal choice might be a Sherwani but that doesn't mean you have to follow the rules and wear a chuddidar and a dupatta with it. 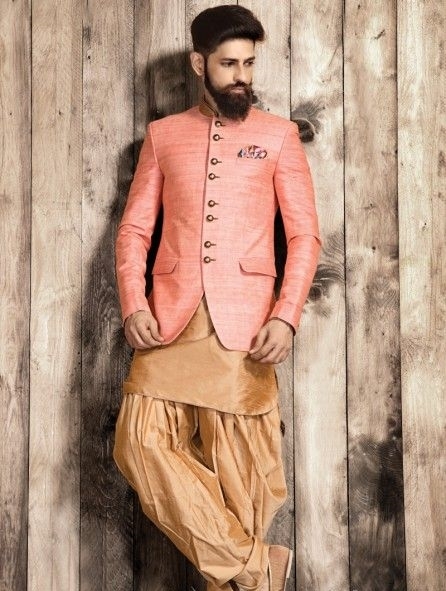 Get creative and experiment with your pants thats you would teamup with your Sherwani. You can team up your heavy worked Sherwani with fitted light colored trousers, prestitched dhotis , Patiala pants and even draped lungis ! 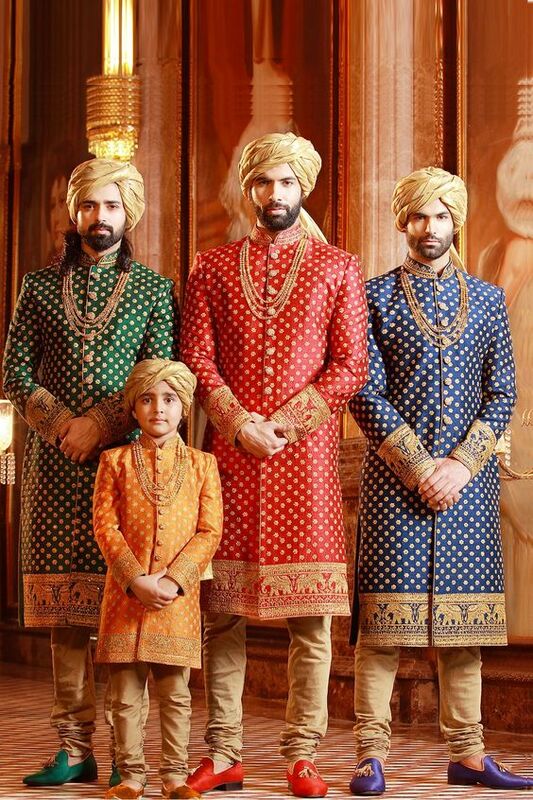 Mens wedding Sherwani is not boring and basic anymore and these picture are exactly portraying that! Complete your whole ensemble with a rich colored pagdi that will compliment your whole outfit. You have loads to choose from different material and different textured sherwani's with intricate detailing and metallic buttons across the length Sherwani will give you a very royal feel! 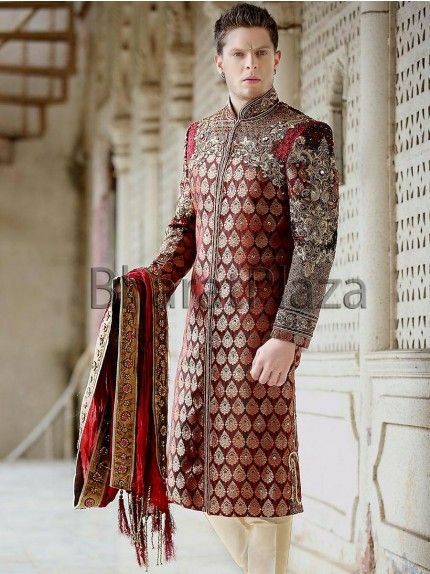 Achkans are basically Indo-Persian mix style of a sherwani which is very popular when it comes to latest Indian groom dress for reception in India. A long knee length coat tailored to perfection will for sure enhance your silhouette and make heads turn at your wedding! ! This closed collar look is a favorite among the men who want an ethnic touch to their royal heritage weddings. The bandhgala fits perfectly with a series of buttons at the top. The trousers teamed up with the Bandhgala are conventional and match the color palette of the jacket. Give way to Bandhgala Sherwanis ! This Indian groom dress is inpired by the style of the beautiful city, Rajasthan, Jaipur. Jodhpuri Suits are the flawless imperial dressing of India and are a great way to make a lasting impression at your wedding. 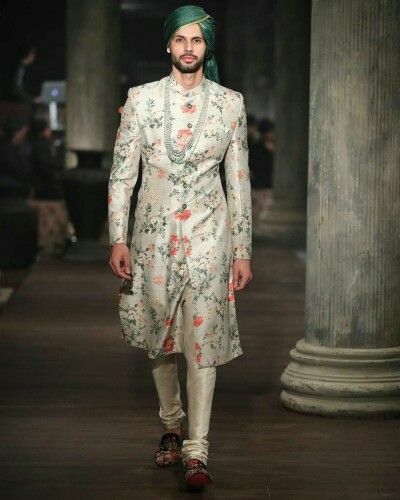 Its unique mix of the Indian and western culture is very sophisticated and will make the men donning it feel like a Rajwadi prince ! 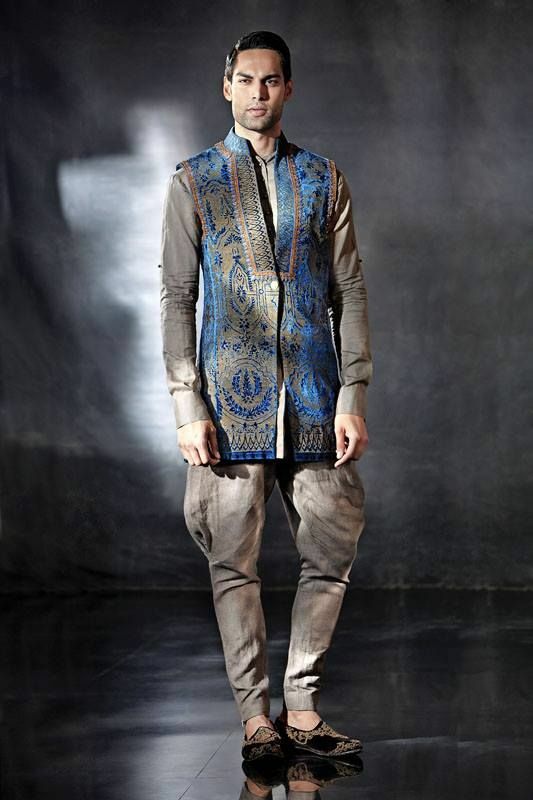 Style with some fab Jodhpur shoes to complete your Indian groom ensemble! 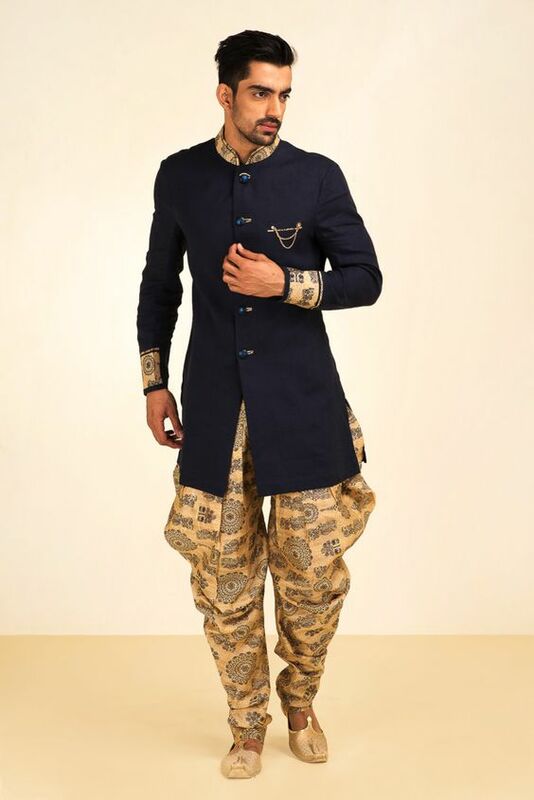 This is one of my personal favorite indian groom dress for reception outfits out of the many we have listed below ! 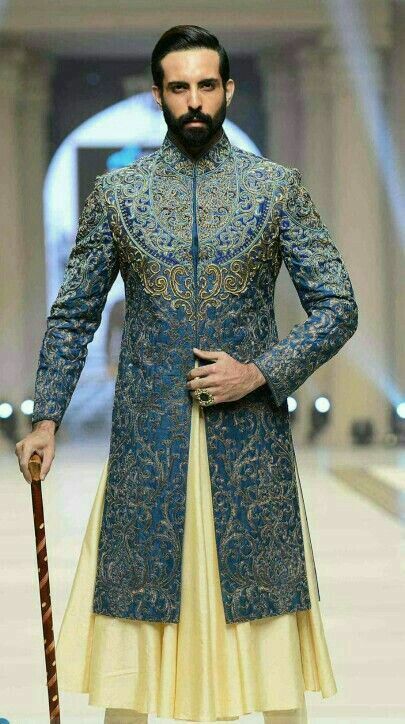 If one thing is elegant and unique and very very different from all the Indian groom wear it has to be the ever so stylish Indo-western Sherwani. This Indian groom dress is never going out of style and is here to stay. With elements of fusion this attire gives a beautifully distinguished thing to the traditional attire. This Indian groom wedding dress picture proves what we have got to say ! Best when matched with a dhoti or a pyjama, the Indo-Western outfit can always be your go to look for your big day! According to us possibly the most fun way to dress for your wedding day is florals and pastels! I love the vibe a floral printed or embellished kurta brings to proceedings, it’s casual, cheeky and just perfect for a day wedding!Go the traditional way with a twist of style. 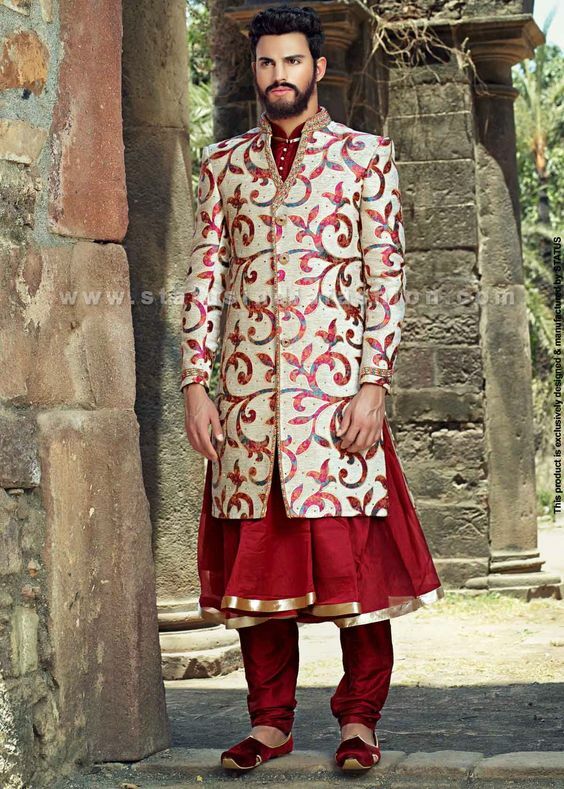 This Indian groom dress has a sherwani with embroidered collars, cuff, button and hemline. 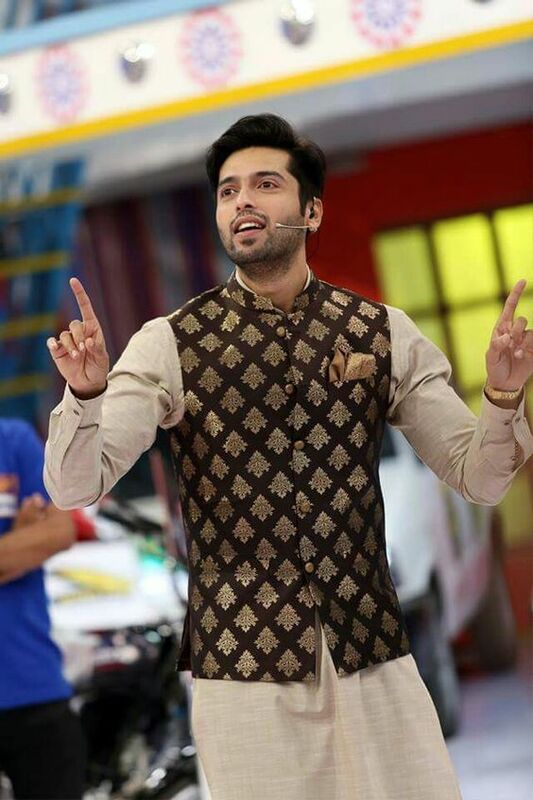 The sherwani is paired with peshawari salwar for a rich and royal effect! Plus the best part about this Indian groom dress is that you don't have tow orry about the dhoti getting undone as it is already prestitched and worn like a salwar giving an illusion of a dhoti! Amazing isn't it? 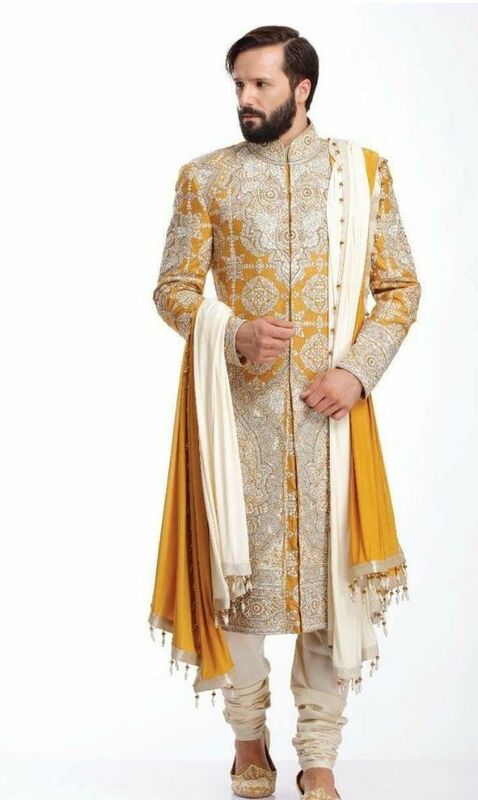 Colour combine gold with a bright color like orange and viola you have an amazing dhoti sherwani ! Great for Marathi grooms and South indian grooms! Cowl kurtas have been the choice of loads of Indian grooms this 2018. it’s classic, elegant and timeless. But right now, we’re loving a slightly twisted version of this kurta which has the addition of a crop jacket over it !. It just pops a little more, it’s a little more fun and definitely feels younger. If you want to spend a little more than you can save and spend on a couture designer men's groom wear. 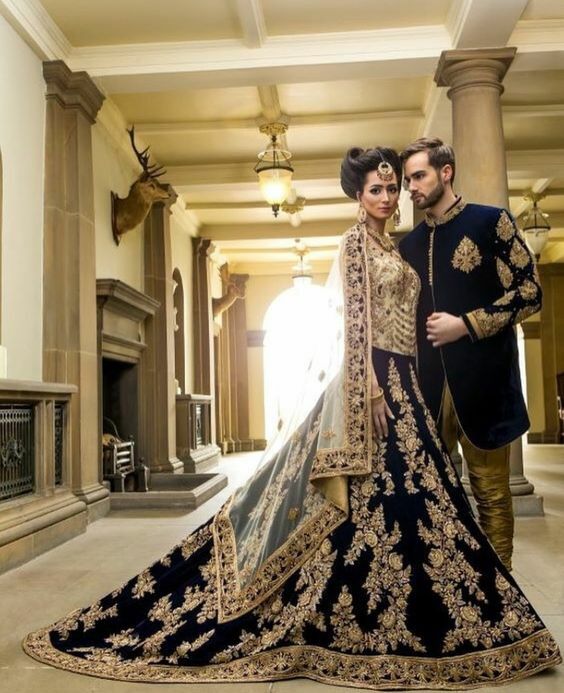 This indian groom dress is a little on th expensive side but will make you the star of the evening. 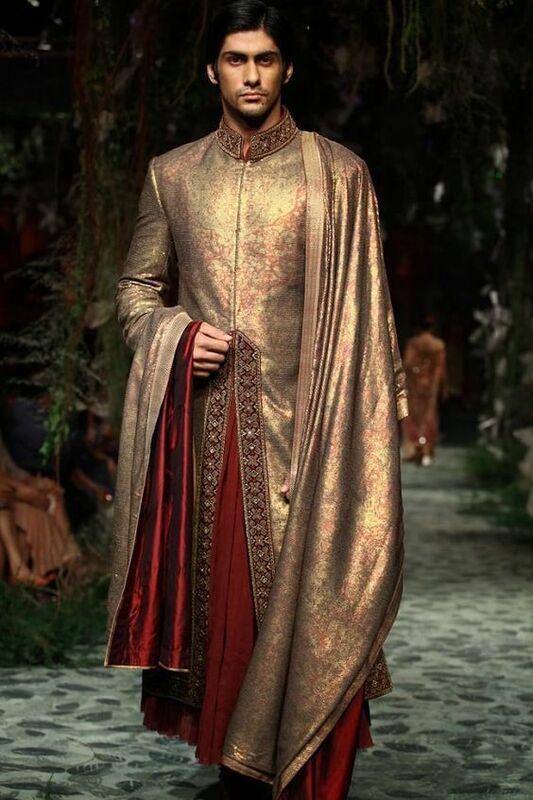 Tarun Tahiliani 's design from Tarun Tahiliani couture exposition 2014 is also a beautiful Indian groom dress if you want to go all royalty! 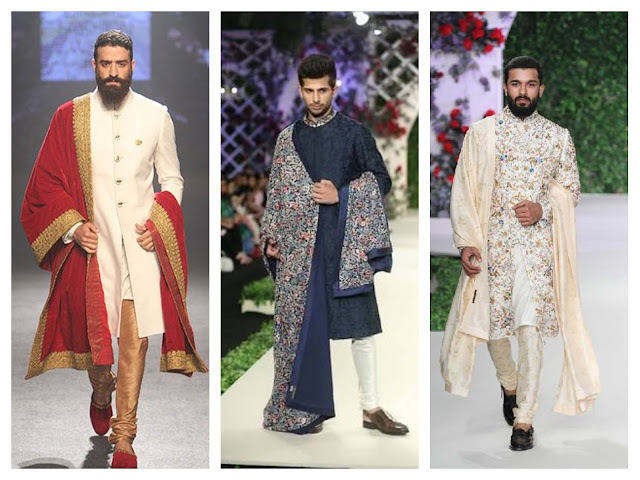 These Indian groom dress ideas can also be substituted as Indian wedding guest outfit Ideas but remember to not overdo it as you don't want to overshadow the bride groom. If you are planning on wearing designer couture , give the accessories a miss and look dapper without taking away the spotlight from the Indian groom. If you are all up for the comfort thing then waistcoats are the thing for you. 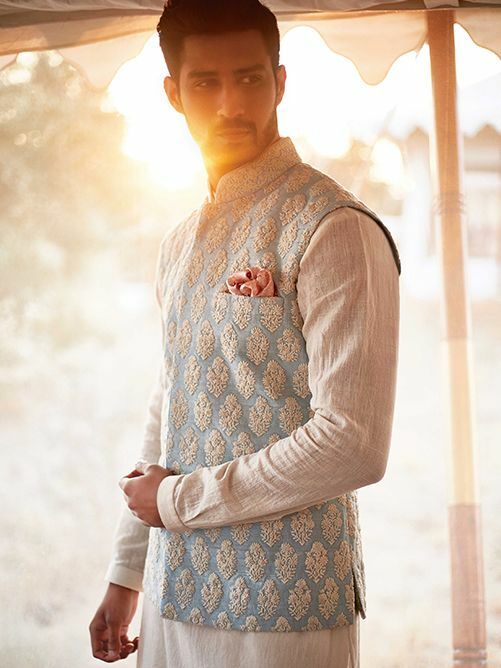 This Indian groom dress is amazing and can be worn over a Kurta Pyajama or any outfit to make it stylish and not compromising on the comfort level. Its a great option for Indian reception as you can dance and sing and do a lot of other things with ease ! 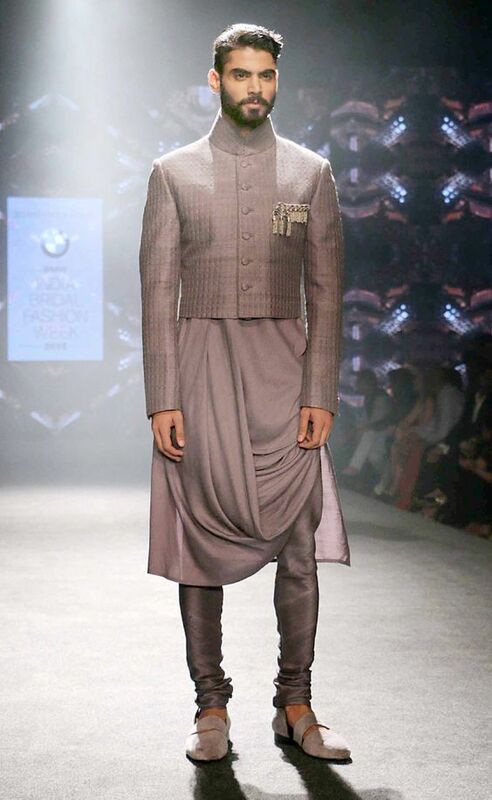 Men's ethnic wear have seen a drastic change and the dupattas are making a comeback. A contrasting dupatta donned on a bold or a beige kurta is the look for your royal wedding and this is the look that is winning hearts across the country. You can also pair printed dupatta if your kurta is plain to give it an edgy look.If your outfit looks incomplete, look nowhere else. Pick a dupatta and pull it off with grace. Heavy embroidered dupattas on velvet are a great way to spice up your laid back sherwani! Have fun with your Dupatta and choose a fun color to pop and give it a fresh and young feel. This indian groom dress for reception has the perfect blend of romantic hues and royalty in it. Add a royal touch by carrying a dupatta in the same color and maetrial as your sherwani for a more regal look! The best way to say hello to innovation is to to try the double dupatta trend. A mix and match of dupatta of two different colors from the same color palette of your sherwani is a great way to spice up things. 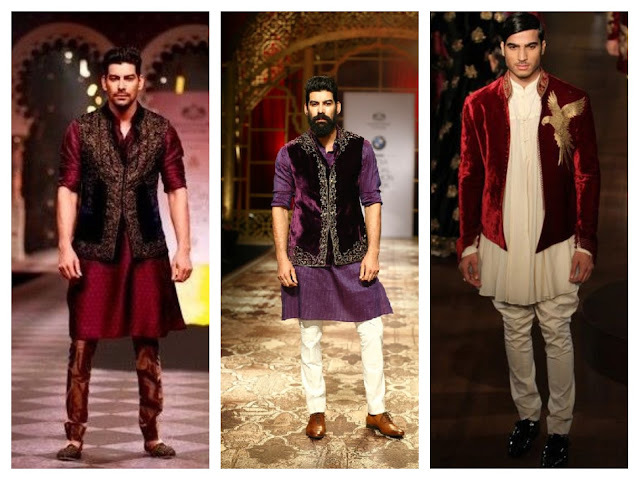 A very trending fabric that is taking the ethnic fashion wear industry by a storm is velvet ethnic jackets. Incredibly rich when worn with a silk kurta that complements the wedding outfit in its perfectly stylish form. Its a great way to make a style statement and is being embraced globally. Pick from various styles to an open button less velvet jacket or an embellished velvet jacket. 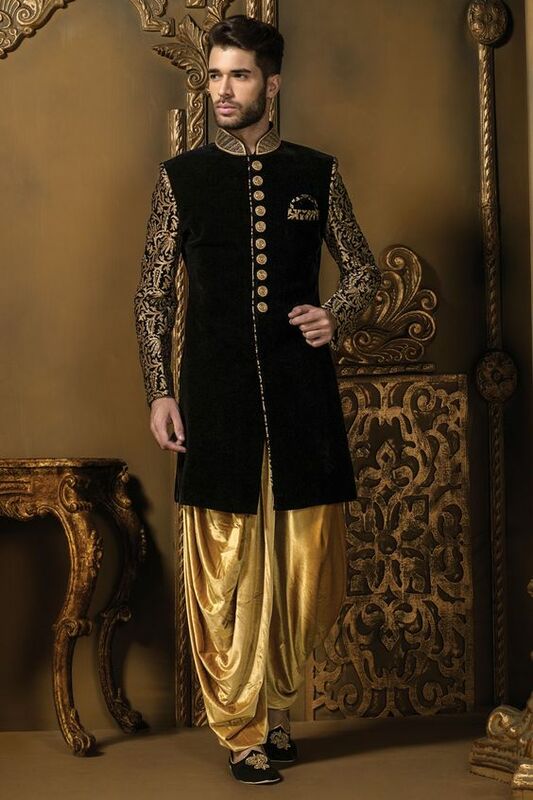 This Indian groom dress outfit with a velvet jacket is a must try for all those wanting to make a fashion statement! 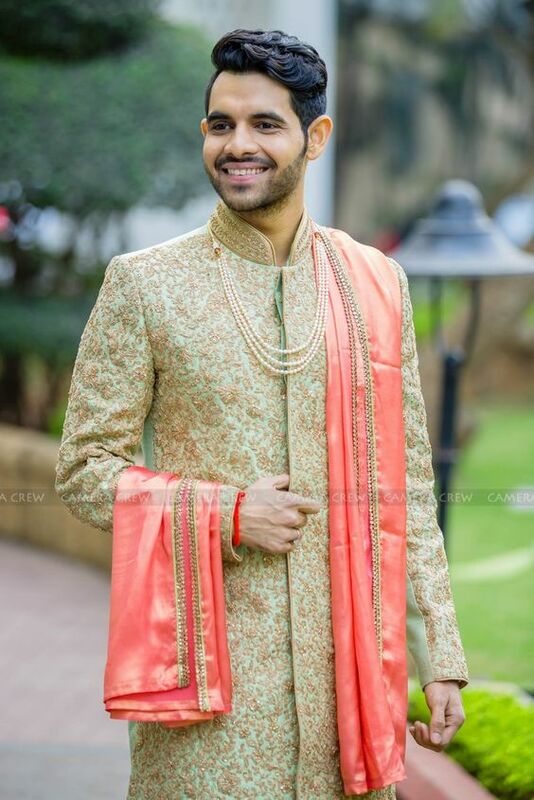 5 Stylish Ways The Indian Groom Can Stand Out! Now that we have covered all the options when it comes to latest Indian Groom dress for reception for men, here's a quick peek at some of the pointers you need to keep in mind while selecting the outfit for your wedding or reception. Also we are listing are favorite ways of letting our Indian groom stand out from the whole crowd on his wedding! Select An Outfit Beforehand: Always try to ensure your wedding suit is ready 2 to 3 weeks before the wedding day. It might seem like an easy task to find a designer ready made Indian wedding sherwani or a Indian wedding suit but getting it tailored to perfection might take off a little too much time. Hence its best get all those multiple fittings and trimmings done before. You don't want to panic at the last moment. If your wedding Sherwani is stitched to perfection on time it is going to make sure that you make a mark on the Big Day! Settle On Something That reflects Your Style And Personality: If you’re one of those bride grooms who are looking to make a statement with your wedding wear and don something that reflects your style and personality, opt for a sherwanis and Rajwadis in a different cut, style, colour or fabric .Indo western Sherwani, floral printed ethnic wear and textured Bandhgalas are all the rage at the minute or you could create a dynamic look by pairing a silk jacquard kurta with a waistcoat . Embrace the little Details: Indian weddings have all your relatives and friends in attendance donning heavy embellished mens wear. Its not considered an offence if any of them are overdressed then you which is why you can stand apart from the crowd by embracing the little details. One of the most simple but effective way to say ‘I’m the groom’ is with your accessories. 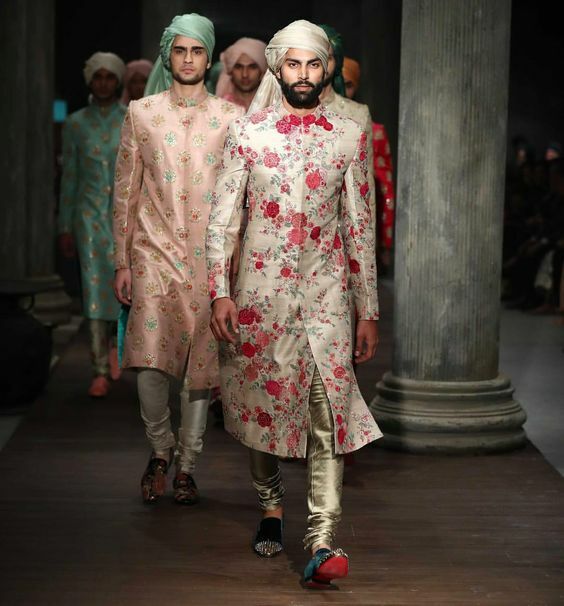 You can wear a printed turban or a turban in royal material or carry a sword for the extra added effect. But if you are one of those that fancy some dapper accessories, don a luxurious watch , some authentic layered pearl necklaces from your heritage or even studded brooch that will set you apart. Co-ordinate with your bride to be: If you and your partner co-rodinate your outfits you are probably going to make the best couple on your wedding day. Its best to discuss whatever you want to wear with your partner beforehand to avoid and color clashing . Plus coordinated couple outfits are the best when you want to stand apart from the crowd. Work Within Your Budget: Try to find an outfit that is within your budget. You don't have to burn a hole to get your perfect wedding suit. You can check the internet websites for quality men's outfits and order from them or get your runway couture suit stitched from a good tailor. Not always a good amount of money can buy you a groom outfit than can be worn over the years. Find a good shop to buy your wedding suit from or we would suggest getting your wedding suit stitched from your favorite tailor! A well tailored suit to perfection is something hat will definitely set you apart from the others ! 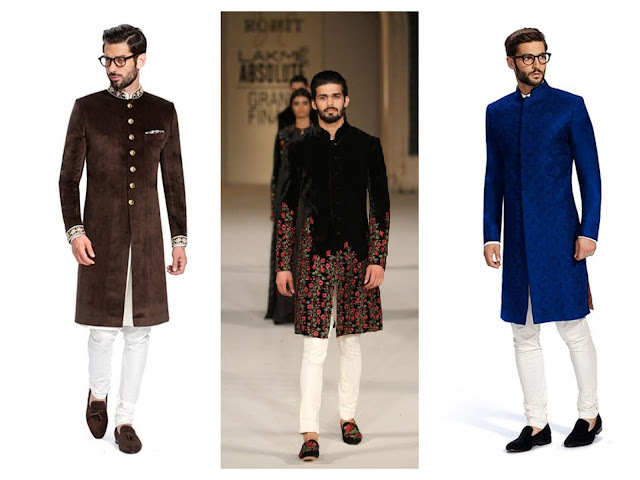 What are you favourite looks for the Indian grooms? Does anyone have any great Indian wedding suit recommendations for us? We’d love to hear all about what the gentlemen are wearing for your big day!